That isn’t to say that everything sticks. If I don’t reinforce the learning, either by practical use or by taking notes, it gets rusty quickly. Sadly, it’s a silent process. I don’t feel the knowledge dropping away in chunks. I just notice it when I type some Git command and get back an error of some type. After this happened a few times, I knew that just (somewhat) passively absorbing the lessons wasn’t going to cut it, so now I have notebooks covered in my barely legible scrawl. It’s helping quite a bit. I feel like I haven’t written a lick of code in a while either. I know I’ve had both WebStorm and Visual studio open, with code loaded, several times in the last two weeks. However, I don’t think I’ve done more than look in that entire period. That needs to change. 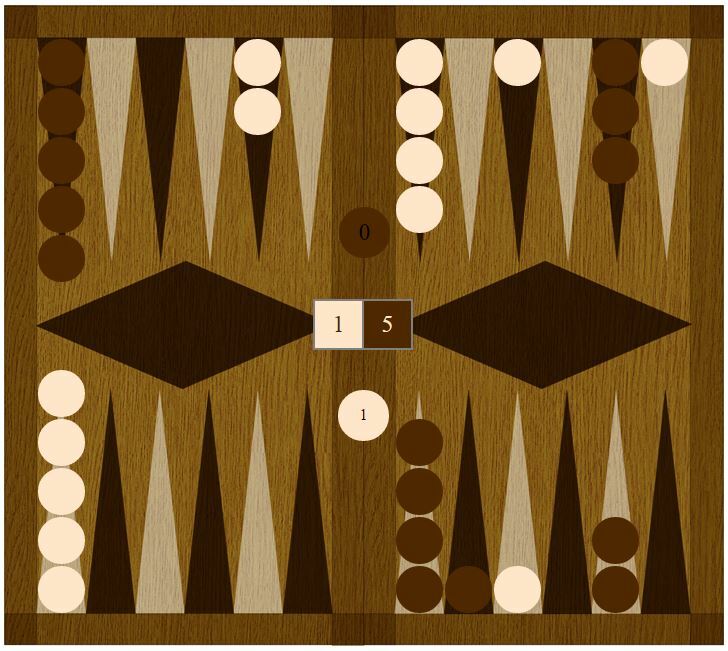 I want to get back to the backgammon game and close up the issues left that make it an incomplete game. I need to work on the couple other programming projects I have going on in the background. Hopefully I can use all of my fancy learning to help me write cleaner code, quicker. I had decided to take my mostly finished project, the backgammon game, and use the One Game a Month challenge to keep me moving forward. Things haven’t exactly worked out that way. Time has been at a premium lately and, while the game is mostly finished, in a lot of ways it is holding me back. I have been spinning my wheels trying to accomplish the final tasks in the scraps of time I have had. Progress is slow and it is sapping my motivation. Seizing on that, my mentor has decided that we are going to work on a project together. He will handle the back end and give me an api, and I will do everything else (with guidance where needed). We started Sunday evening with a long discussion about the functionality he’s looking for. Yesterday I worked on getting some bare bones of HTML and CSS going, along with a little itsy bitsy piece of JS/jQuery that performs some useless DOM manipulation. This morning I plopped together the Angular, dummied up some data (in JSON format, of course) and got it to appear on the page via an expression. Yay! This should be a short update. A while back I talked about having a backup in case cloud9 was down or I couldn’t connect to the internet. Those two conditions actually have pretty big implications. If cloud9 is down and I can connect, I’d like to use another cloud or internet based ide so I can work on my chromebook. If I can’t get connected, I think my chromebook becomes an expensive (although not that expensive) paperweight. In that case, I can look at more traditional desktop IDEs. So far I like it. I may even love it, but I am still in the awkward learning-how-to-make-things-go phase. The hints and warnings are a lot more detailed and helpful (bordering on pushy). It plays nicely with GitHub, which isn’t a surprise but is still nice to confirm. I knew I had some slightly sloppy code and sure enough,WebStorm pointed that out for me and offered to turn some of my lazier declarations into inline declarations. That’s an interesting feeling. I hope it makes me more aware instead of more blasé. I’ll go into more detail later, with before-and-after examples and other hints I have already picked up. It’s a good product. I am using the 30-day free trial. I’m already tempted to just spend the $49, but I will restrain myself until the trial is up. It is definitely worth a look. I would like to be posting (at least) three times per week, and I’m trying to make that happen. Sometimes though, my life is just too chaotic. I don’t think I have talked about my personal life much, if at all. During the day, I am a mild-mannered stay-at-home dad of two beautiful but rambunctious children. Occasionally that day stretches into the evening. Parenting is a complex topic that I could go on and on about, but it’s, um… out of scope for this blog. The short version is, it is a wonderful experience that leaves me feeling scatterbrained and exhausted some days, and it’s part of the reason why I can’t always get a post up. That said, I am still working and learning and doing programming-type things. Andrea’s post yesterday got me to check out even more online resources for the burgeoning developer. I jumped right into freeCodeCamp, and have completed a few of the challenges. I tend to need a lot of review of topics, and like Andrea, I find doing the same exercises over and over can be a little brain-numbing (and counter-productive). 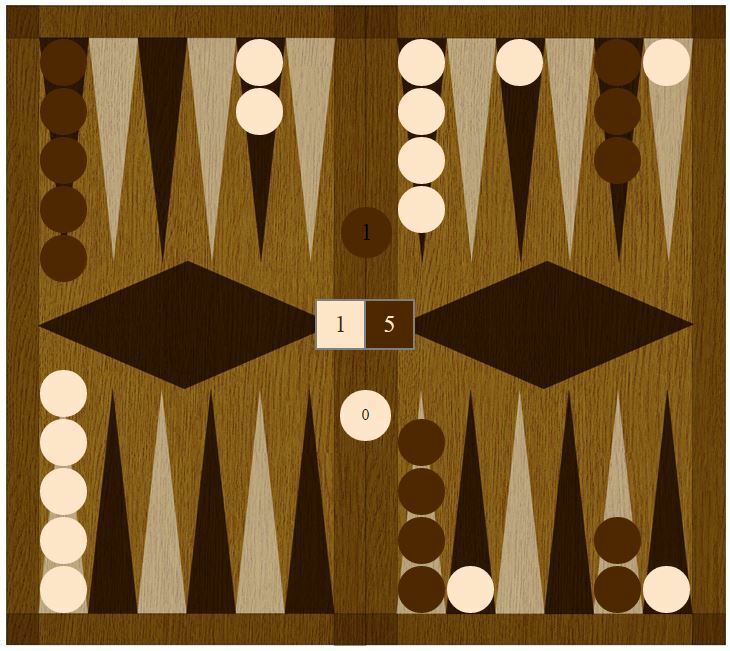 When I finally got a relatively quiet block of time, I decided to work on my backgammon game a bit. I had identified a task that I thought I could get through quickly. It picks up right where my last post left off, with my rollDice function. 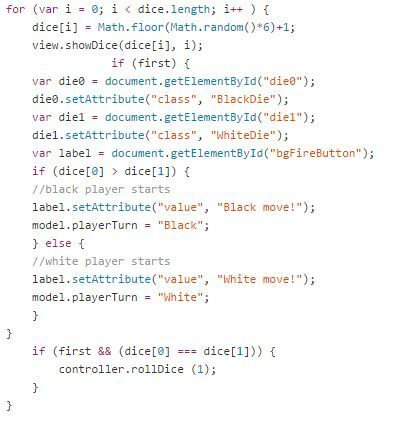 Last time, I managed to get the dice to change color properly, but the game wasn’t actually choosing a starting player, that was hard-coded to be the “black” player and the game just moved on from there. I figured it was time to change that! Actually, there was an iteration before that. One that just rolled the dice and was missing the if (first) loop. Knowing how I ended up structuring the function, I can already see a problem with what I had above. Two (maybe more?) problems actually. It is already becoming a messy bit of code. I don’t have all the lingo and philosophy down, so I can’t say what exactly bothers me about functions getting larger and more packed. Maybe I want more “abstraction” or “encapsulation” or some other concept that hasn’t osmotically entered my lexicon. But, you’ll see, it gets messier and cleaner. I knew I needed to compare the dice and select a winner. Sounds simple. I’ve got the dice, do a comparison, pick the winner, change the window dressing, done! This is the messier phase. Less readable. Crammed in a comparison. Remembered I needed to reject a roll of doubles. Tacked that on. You can tell I was running on pure horsepower by the “&&” in that if statement. I can’t even remember if this worked. I went through one version that did the comparison but through sloppy syntax, it just made every roll a “white” win. Sometimes I work way harder than I need to. After a few deep breaths and a snack, I saw a better way. Better, in this case, meaning more readable. It’s possible that what I did next was actually a step backward, but I’m knew enough not to know any better! I realized that what I was trying to do still fit under the mantle of the “first roll” and so I nested it into the already existing if (first) loop. I then slammed the check for a double roll into the existing dice comparison loop. I keep reading about recursion and so I wanted to try that. (I hear it makes your code more impressive!). I changed the passed argument from “1” to “true” to make it more explicit. The best part, it works! I think. I really need to start using some type of testing so I can say, “no, really, it works!” but for now I have yet to run into doubles on a first roll, so it seems to be working. I can’t actually say how long that all took me, I should start keeping track, that would be a useful statistic. It probably took me longer than it should have, but that’s okay. I’m one step closer to finished. I am hoping to wrap this up and submit it to the One Game A Month challenge. It’s almost playable at this point, I really just need to set up the bearing-off stage and figure out how to know when someone has won. I’d also like to clean up the presentation a little. “Just a few more hours” of coding, really! My friend and mentor, Chris Gomez (check out his blog, he needs the motivation to keep posting too!) made an interesting comment to me the other day. He told me I should spend some time focusing more on the details of my program and less on the big picture. Andrea’s comment on yesterday’s post helped hammer home this profound lesson on why getting outside opinions is important. In a lot of ways, I thought I had been pretty detail oriented, but when I looked back at it, I could see I had been swept up in the idea of catching my blog up to the current state of my program. With that in mind, I am going to start looking back through my code and trying to explain what drives the choices I make. I’ll start with something I just did tonight. 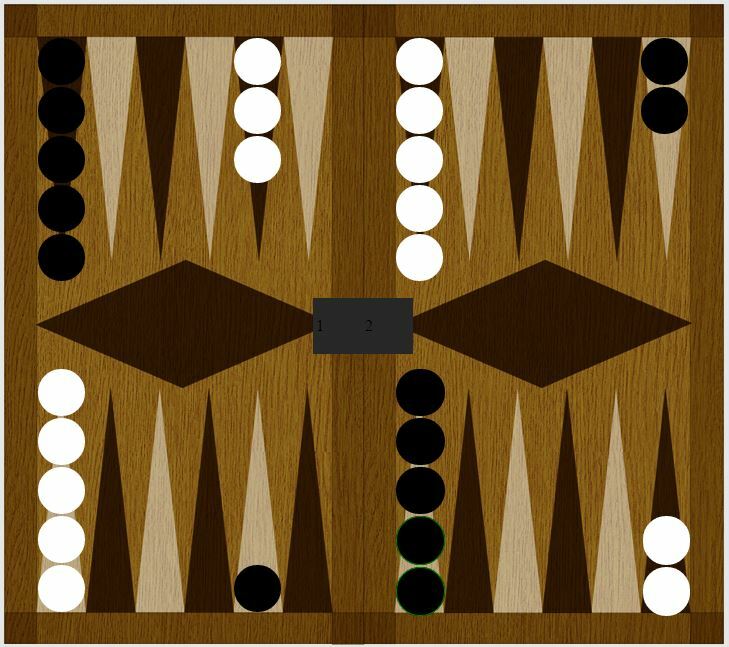 In backgammon, the first time dice are rolled, each player rolls one die of his or her color. The high die wins and that player moves, using those two dice. Every turn after that, the player rolls both if his or her dice. So on the first roll, there are two colors of dice and on subsequent rolls, the dice are one color, the player’s color. I wanted to capture this functionality to help indicate which player was up. In order to facilitate this operation, I added a parameter to my rollDi ce function called, simply enough, first. If rollDice is told that this is the first roll of the game, it will set the css class of each of the die elements to the appropriate colors. One black and one white. (I just realized that I am concatenating two strings that don’t need to be concatenated and could be just “die0” and “die1”. That is a relic of a previous attempt to set them in a cleaner manner. Whoops!) The rest of the function just sets each of the die values to a random number from 1 to 6 and then tells the view to update the page. A short aside. I am trying, probably very poorly, to implement an MVC pattern. Hence the view, and obviously there is a model and a controller. I am not sure how successful I have been at this, but I am pretty sure trying can’t hurt! The way my game starts is when the player (for now you can only play against yourself, hopefully that will change in the future) clicks a button labelled “Reset Board.” That fires my init function that, in part, looks like this: Pretty simple. It just passes a 1 into the parameter “first” which makes the if statement evaluate to true and initializes the dice, as it were. Further down in the mess is another important call related to the color of the dice, changeDiceColor. That does exactly what it sounds like it does, and along with the showDice, it is called whenever the player side changes and the dice are rolled. 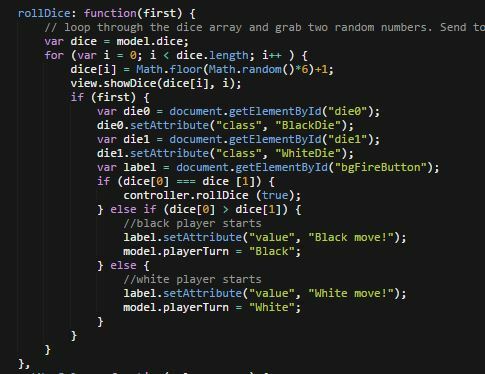 (You can see the call to showDice at the end of my rollDice function in the first image.) They are pretty straightforward functions reaching into the html to change a value in one case and a css class in the other. Usually, my goal is to make small, focused functions like showDice and changeDieColor. Sometimes I just keep cramming functionality in where I know it doesn’t belong just to get things working. I figure I can always come back and separate things out later. I haven’t done that yet, but I could… I promise! It can be hard to hold a lot of discrete parts in my head at the same time and so for the sake of moving forward I do things that I am sure are not best practice. As I get more comfortable with all of this, I hope to be able to make better first-pass decisions and rely less on the idea of fixing things in the future. In case it wasn’t clear before, I am open to questions and comments and criticism and just about anything else you can think of, so please, feel free to ask or teach or just say hi. The interaction and community are a very powerful motivator for me. Thanks for reading! … and Black has deployed her jailed piece and captured a White piece. I haven’t been as active here as I want, but I am still moving forward. The holidays are a great excuse for not getting things done, right? I’ll be brief, because we all have New Year’s parties to attend, I’m sure! I updated the look of the checkers a little, using nothing more than a border-radius in the css. I also implemented a way to stack the checkers, or rather, to indicate that they are stacked, again, in the css. 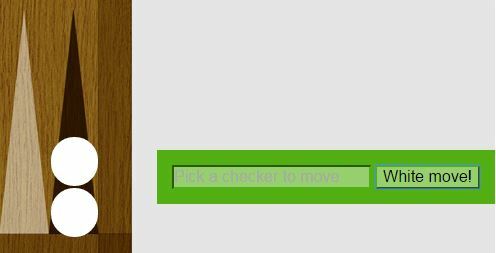 For now a green ring around the checker means there are two stacked and a red ring means three are stacked. There are two green ringed tokens in the image to the right. I changed the move count to two, allowing each side to move twice before the turn changes. In the future I will check for doubles and make that f our moves, as well as adding a way to end the turn if there are no more valid moves available. I’m still taking player input via the text box, but pretty soon I think I will get away from that in favor of mouse/touch interaction. For the curious, here is my modified findLowest function. This is what allows the checkers to stack. I feel like it has gotten a little unwieldy, but for now I am weighting my desire to finish the game over my desire for clean code.